Hey there! Thanks for dropping by Spineless Liberal! Take a look around and grab the RSS feed to stay updated. See you around! The chain of dominoes has brought the regimes of Ben Ali in Tunisia and Mubarak in Egypt, may topple Gaddafi in Libya… and other presidents and monarchs are in peril. What has happened in these other countries? Welcome to the Spineless Liberal’s fact-file on the Arab Spring. Divided up into four, including a brief description of the protests and possible outcomes – first up, the success stories. Egypt and Tunisia. The success stories…thus far… of the Arab Spring. Unemployment; food inflation; corruption; lack of political freedoms and poor living conditions led to widespread protests against President Zine El Abidine Ben Ali of Tunisia. Back on December 17th, Mohamed Bouazizi, a Tunisian street vendor, set himself on fire in Sidi Bouzid, due to alleged harassment by a municipal official. Peaceful marches the next day were met by violence from the police – reportedly including tear gas attacks. Other protesters (Lahseen Naji and Ramzi Al-Abboudi) also killed themselves during the protests. On the 24th of December, Mohammad Ammari was shot in the chest and killed by police in Bouziane. Eventually, over 200 would die in the protests. 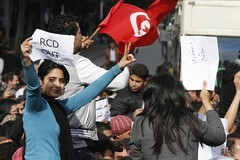 By the 27th, the protests reached Tunis, the capital, and as the protests escalated, so did the violence. Labour Unions and lawyers joined the protests and it spread across Tunisia. By the 14th of January, President Ben Ali resigned and fled to Saudi Arabia after 23 years in power. This left Prime Minister Mohammed Ghannouchi in effective control. On the 27th, he announced a reshuffle of the Cabinet, removing 6 former members of Ben Ali’s Constitutional Democratic Rally (RCD) party had left the interim government. Only Ghannouchi remained from the RCD. While he vowed on the 22 that he would resign after holding free elections within six months, the protests continued against him personally, demanding his resignation, and the cleansing of the cabinet of any last vestiges of the RCD. Ghannouchi resigned on the 27th of February, and was replaced by Beji Caid el Sebsi, a lawyer and former cabinet member in the early 1990s. By the 3rd of March, the new Acting President, Fouad Mebazaa, promised elections to a Constitutional Assembly on the 24th of July 2011, and general elections soon after. On the 7th, the secret police have been dissolved, followed by the RCD themselves on the 9th. We may now see a truly democratic regime in Tunisia. However, March 1st also saw the foundation of the Renaissance Party or Nahda, an Islamist opposition group. Ben Ali may have been despotic, but the West widely supported him for helping us the fight against extreme Islamism – perhaps with Ben Ali’s overthrowing (he is now reportedly in a come in Saudi Arabia, following a stroke) we will see a more Islamic state in Tunisia. Egypt was widely inspired by the Tunisian protests, with protesters quoted as shouting “Ben Ali tell Mubarak he is next”. While Ben Ali ruled Tunisia for 23 years, Mubarak has reigned in Egypt since the assassination of President Anwar Sadat in 1981, meaning an impressive 30 years at Egypt’s helm. Following another case of self-immolation, the Day of Revolt on the 25th of January, 2011 was the day tens of thousands of protesters gathered on the streets of Cairo and other cities. The next day, the Egyptian government shut down the internet. By the 28th, the protests had reached the “Friday of Anger”. As February dawned, Mubarak offered concessions – that he would not run for another term in office, and would merely stay to oversee a peaceful transition. This was not enough for the protesters, and protests continued until Mubarak’s resignation on the 11th of February, leaving the Supreme Council of the Egyptian armed forces in change of the country. Vice President Suleiman was nominal leader. By now, the army has said it will not field a candidate in the September elections, has dissolved Parliament (as per the demands of the protesters), and dismantled the secret police. The death toll stands at 384 dead, and over 6,000 injured. Most recently, on the 19th of February, a constitutional referendum passed with 77% in favour – this means amendments to the constitution, hopefully guaranteeing fairer presidential and parliamentary elections to take place. However…there’s always a however, opposition figure Mohamed El Baradei (former head of the International Atomic Energy Agency) was opposed, claiming that elections this summer would only benefit the National Democratic Party (Mubarak’s party) and the Muslim Brotherhood, now openly active in Egypt…the only two groups established enough to actively campaign in an organised manner in the elections and also the only two groups campaigning for the yes vote. Huhne knew? A by-election in Eastleigh. Enter your email address to get some political commentary and more - straight to your in-box! Welsh Values - What does it mean to be Welsh. Subscribe by e-mail for Alerts!